Lehtinen, A., Nieminen, P. & Viiri, J. (2016). Preservice Teachers’ TPACK Beliefs and Attitudes Toward Simulations. 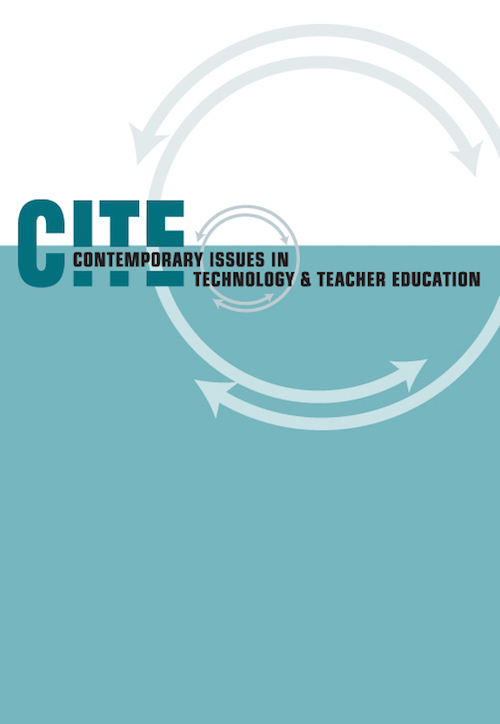 Contemporary Issues in Technology and Teacher Education, 16 (2), 151-171. Waynesville, NC USA: Society for Information Technology & Teacher Education. Retrieved April 22, 2019 from https://www.learntechlib.org/primary/p/161874/. Brantley-Dias, L., & Ertmer, P.A. (2013). Goldilocks and TPACK: Is the construct ‘just right?’ Journal of Research on Technology in Education, 46(2), 103-128. Carifio, J., & Perla, R.J. (2007). Ten common misunderstandings, misconceptions, persistent myths and urban legends about Likert scales and Likert response formats and their antidotes. Journal of Social Sciences, 3(3), 106. Carifio, J., & Perla, R. (2008). Resolving the 50‐year debate around using and misusing Likert scales. Medical Education, 42(12), 1150-1152. Chai, C.S., Koh, J.H.L., & Tsai, C. (2010). Facilitating preservice teachers' development of technological, pedagogical, and content knowledge (TPACK). Educational Technology& Society, 13(4), 63-73. Chai, C.S., Ling Koh, J.H., Tsai, C., & Lee Wee Tan, L. (2011). Modeling primary school preservice teachers’ technological pedagogical content knowledge (TPACK) for Contemporary Issues in Technology and Teacher Education, 16(2) meaningful learning with information and communication technology (ICT). Computers& Education, 57(1), 1184-1193. Chen, R. (2010). Investigating models for preservice teachers’ use of technology to support student-centered learning. Computers& Education, 55(1), 32-42. Drolet, A.L., & Morrison, D.G. (2001). Do we really need multiple-item measures inservice research? Journal of Service Research, 3(3), 196-204. Eccles, J., Adler, T.F., Futterman, R., Goff S.B., Kaczala, C.M., Meece, J.L., & Midgley, C. (1983). Expectancies, values and academic behaviors. In J.T. Spence (Ed. ), Achievement and achievement motivation (pp. 75-146). San Fransisco, CA: W.H. Gardner, D.G., Cummings, L.L., Dunham, R.B., & Pierce, J.L. (1998). Single-item versus multiple-item measurement scales: An empirical comparison. Educational and Psychological Measurement, 58(6), 898-915. Gorges, J., & Kandler, C. (2012). Adults' learning motivation: Expectancy of success, value, and the role of affective memories. Learning and Individual Differences, 22(5), 610-617. Graham, R., Burgoyne, N., Cantrell, P., Smith, L., St Clair, L., & Harris, R. (2009). Measuring the TPACK confidence of inservice science teachers. TechTrends, 53(5), 7079. Herrington, D.G., Bancroft, S.F., Edwards, M.M., & Schairer, C.J. (2016). I want to be the inquiry guy! How research experiences for teachers change beliefs, attitudes, and values about teaching science as inquiry. Journal of Science Teacher Education, 27(2), 1-22. Hinkle, D.E., Wiersma, W., & Jurs, S.G. (2003). Applied statistics for the behavioral sciences (5th ed.). Boston, MA: Houghton Mifflin. Koballa, T.R.J. (1989). Changing and measuring attitudes in the science classroom (Research Matters to the Science Teacher, No. 8901). Athens, GA: The University of Georgia and The National Association for Science Teaching. Koehler, M.J., Shin, T.S., & Mishra, P. (2012). How do we measure TPACK? Let me count the ways. In R.N. Ronau, C.R. Rakes& M.L. Niess (Eds. ), Educational technology, teacher knowledge, and classroom impact: A research handbook on frameworks and approaches (pp. 16). Hershey, PA: Information Science Reference. Koh, J.H.L., Chai, C.S., & Tsai, C. (2010). Examining the technological pedagogical content knowledge of singapore pre‐service teachers with a large‐scale survey. Journal of Computer Assisted Learning, 26(6), 563-573. Kriek, J., & Stols, G. (2010). Teachers' beliefs and their intention to use interactive simulations in their classrooms. South African Journal of Education, 30(3), 439-456. Lin, T., Tsai, C., Chai, C.S., & Lee, M. (2013). Identifying science teachers’ perceptions of technological pedagogical and content knowledge (TPACK). Journal of Science Education and Technology, 22(3), 325-336. Maeng, J.L., Mulvey, B.K., Smetana, L.K., & Bell, R.L. (2013). Preservice teachers’ TPACK: Using technology to support inquiry instruction. Journal of Science Education and Technology, 22(6), 838-857. Ozgun-Koca, S.A., Meagher, M., & Edwards, M.T. (2010). Preservice teachers' emerging TPACK in a technology-rich methods class. Mathematics Educator, 19(2), 10-20. Rutten, N., van Joolingen, W., & VanderVeen, J. (2012). The learning effects of computer simulations in science education. Computers& Education, 58(1), 136-153. Ryan, S. (2004). Message in a model: Teachers’ responses to a court-ordered mandate for curriculum reform. Educational Policy, 18(5), 661-685. Schweingruber, H., Keller, T., & Quinn, H. (2012). A framework for K-12 science education: Practices, crosscutting concepts, and core ideas. Washington, DC: National Academies Press. Stipek, D.J., & Byler, P. (1997). Early childhood education teachers: Do they practice what they preach? Early Childhood Research Quarterly, 12(3), 305-325. Teo, T. (2009). Modelling technology acceptance in education: A study of preservice teachers. Computers& Education, 52(2), 302-312. Wanous, J.P., Reichers, A.E., & Hudy, M.J. (1997). Overall job satisfaction: How good are single-item measures? Journal of Applied Psychology, 82(2), 247. Wigfield, A., & Eccles, J.S. (2000). Expectancy–value theory of achievement motivation. Contemporary Educational Psychology, 25(1), 68-81. Zacharia, Z., Loizou, E., & Papaevripidou, M. (2012). Is physicality an important aspect of learning through science experimentation among kindergarten students? Early Childhood Research Quarterly, 27(3), 447-457.